I found your site on accident today and I love it! 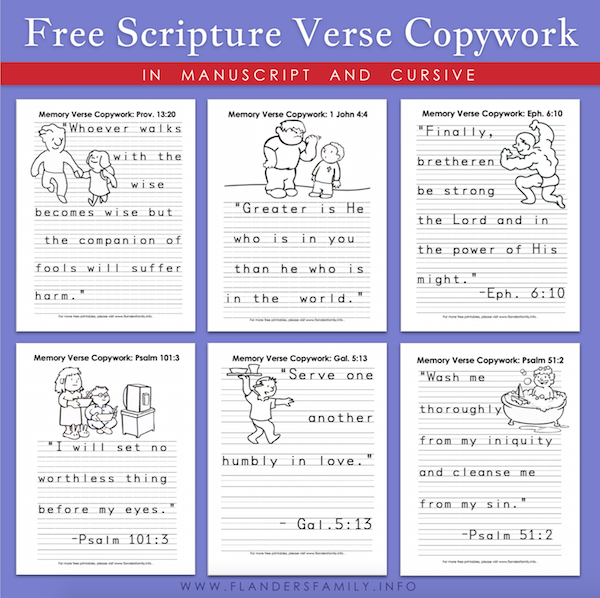 I am looking for Scripture copywork in print rather than cursive. Is this something I am not finding on your site? I’m glad you’ve enjoyed looking around our website. I hope you’ll come back. Let me know if there’s anything else I can help you find. i just love these. i wondered if they were available in KJV at all? Some of the verses are KJV, but obviously not all of them. I love the lyrical sound of KJV in many passages — especially the Psalms — but prefer some of the easier-to-understand translations for other verses. That’s why I use KJV for memorization and songs, but gravitate toward more contemporary word-for-word translations from the original language (my favorite is NASB) for Bible study. Of course, there is still something to be gained from reading passages in a variety of accurate translations, including KJV, NIV, ESV, NET, as well as the Living Bible and the Amplified. For that reason, I do much of my Bible study online at BibleHub where I can easily compare different translations.